so all that plus the laptop full of favourite shows and movies should keep mae mostly preoccupied, i think. soph is going to have to be content with whatever mae doesn't want to play with at that moment (as usual) and lots of snacking. i'm bringing meusli bars (carman's), sultanas, multigrain crackers, freeze dried apple and strawberries, a bit of fruit for the first leg of the flight, cheerios, cruskits, maybe some digestive cookies (but they are soooo crumbly)... nothing too out of the ordinary from our usual snacks. any last minute suggestions? we're pretty tight on space but let me know if you think of something brilliant we should take along to play with or eat! I know you probably don't have the room or time -but fuzzy felt (if you rememeber it) was always a great car entertainer back in the day. A little felt covered board and then heaps of cut outs to make pictures and little scenes . I hope it goes swimmingly . And how about a book or comic? jodie, i love fuzzy felt! i actually have a vintage farm one stashed away and a couple of new sets, too but all those little pieces... i fear we'd leave half of them stuck to the airplane seats. would be ace in the car though! thanks, marit! i forgot to write that i'm going to let mae pick out a magazine at the airport, a special treat to kill time while waiting. a little book for soph would be good though, she loves them lately. awesome thinking with these items! i did a looong similiar trip in Feb this year (melb to alabama usa with a 3.5 and 1.5 yo solo!) i packed too much stuff for the kids...my 3.5 ended up GLUED to the kids inflight ent. - 10hours straight viewing! and didnt eat a damn thing i packed snack wise. my 1.5 y.o was tricky...some stickering and thats about it. i promise you i packed such a goodie bag of surprises and treats but honestly i could of halved it and been more than fine. i think your baby soph will have fun just playing with the tv remote buttons. glo stick is v.good, digital photo keychain with dad in it brilliant! missing dad is a hard part : ( ! a small favourite book for soph is good too. i picked up a small cheap magnetic drawing slate board with pen for $2 that wipes clear after a scribble and that was a hit for both my kids. you know the ones? good luck & have a great time once you're there! In a pinch we always have good fun with a couple of the airplane drinking cups. 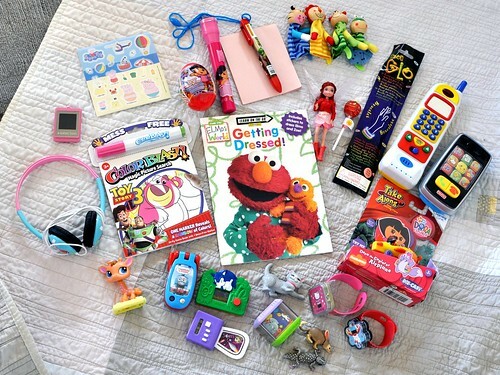 They become phones, goggles, stacking things, and, with those elmo stickers, you could do an impromptu craft project and turn them into dolls. Looks like you are totally prepared!! I wish you the best on your looong day of travel. My favorite non-electronic activity with Bird has been Priddy sticker books - #'s, abc's, etc. Saved us when we we've been stuck on the runway for who knows what reason. And I imagine chupas are what we call lollipops :o) They're a total necessity. daisy, i know, you just never know what they will actually want to do. when mae was one and we flew to canada, we packed TONS of carry on - blankets, toys, books - and she really didn't care about any of it, just wanted to grab at the tv in the seat and look at the people behind us. and not sleep. it was hell, actually. i can't believe i am doing it again! alone! sarah, the airplane drinking cups thing is brilliant, soph loves stacking things and putting stuff into vessels - might actually keep her occupied for a few minutes! Wow, looks like you've got it all covered. I think a book would be a good idea, too. I've heard athose mini etch-a-sketch drawing thngys are quite handy for long haul travel. Chupa chips are an excellent calming tool when you can feel a melt down coming on. My kids had their first ones at the tail end of a 12+ hour drive recently. They last for ages, too, which is good. seaweed sakatas - i don't go anywhere without them. good luck with the flight - it'll be worth it when you get there and your family sees the girls. I have to say: Mom and I are getting VERY excited for you and the munchkins to arrive! It looks like you're well stocked for the trip; the girls are going to love all those little goodies. The one thing I would add is maybe a special flask for YOU though. ;) Or Baby Gravol. i would definitely steer clear of digestives, also flakes and dry weetbix for the same reason! Dried fruit is good - apricots, apples, peaches etc. How about a pack of cards? The kiddie version of memory, or Uno. You can get jumbo ones that are easier for little hands. DVDs? chupa chups and baby wipes - ooh yes!! contstantly getting stuff out of the overhead locker is a pain...i used a little drawstring bag filled with some chupa chups and small items (plus spare nappy/baby wipes) to easily grab and put with us in our seat and to contain all our bits. I suggest a box of bandaids (I'm not kidding) and a container of silly putty. ...'Sitting on a plane for 24 hours with a three year old and a 1 yr old - priceless!' :) good luck matey. You don't need it. You're sooooo organised!